The best part about being a bee keeper is of course the honey! This year was my first harvest and I worked with Vince and Ellen Aloyo to "extract" over 50 pounds of the delicious stuff. I sell the honey from our hives on Temple's campus to support the bee program- buying new equipment and tools for the hives. This year, one of our students, Kristen Brown, designed a beautiful label for us. A stylized honey comb in Temple red. The extraction process was a fun, sweet smelling, and very sticky event! Going through a harvest makes makes you appreciate all the work the girls (bees) put into making the honey and your hard work makes the honey taste that much sweeter. The honey is located in wax comb that the bees build in wooden frames. The honey is held in the comb by a thin layer of wax called he caps. 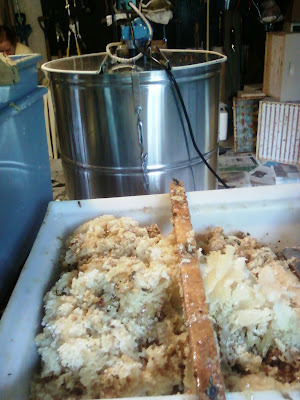 The beekeeper removes the cappings with a heated knife. Then the frames are placed in an extractor which spins the frames, causing the honey to fly out. There is a spout at the bottom where the beekeeper collects the honey. It has to be strained a few times to remove pieces of wax and the inevitable bee parts that end up in the honey. Then our friends Vince and Ellen store their honey in gallon sized water jugs until they are ready to package it in smaller containers for sale. Boxes of frames waiting to be uncapped- note the layers of newspaper on the floor... this is a sticky process! This metal extractor holds 12 frames. The wax cappings are in the foreground.